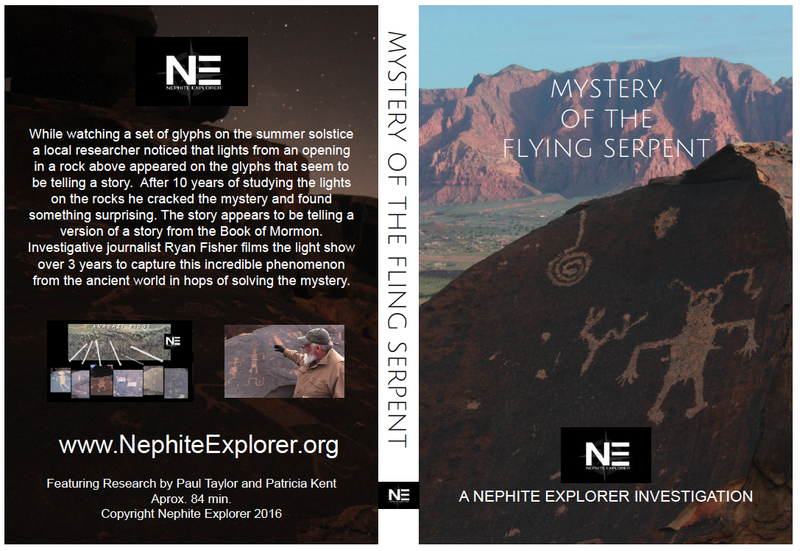 Mystery of the Flying Serpent NOW ON DVD! Cumorahland DVD – Did the final war of the Nephites and Lamanites take place at the Hill in western New York? If so is there any achaeological evidence of the great battles? Investigative journalist Ryan Fisher sets out to answer these questions once and for all. What he discoveres is ancient hill top forts numbering in the hundreds as well as the location of the Nephite seas and much more. Length 88min. The book of Mormon describes an advanced civilization that had metal weapons, agriculture and machinery. Is there any evidence of this in the archaeologicl record? In the mid 1800’s people in Michigan began uncovering artifacts from ancient mounds by the thousands. Tablets that contained writing and pictures of what appeared to be a lost race of people. But these controversial finds have been hevily critisized by main stream archaeology because they we’re found by amateur archaeologist hundreds of years ago. Many of these tablets show parallels to the account of the Book of Mormon. Can these be authenticated? If so they may shed new light into that ancient people. NEPHITE EXPLORER SEASON ONE ON DVD! Get every episode from season one on DVD including “Search for the promiseland” 5 part series and “Search for the Nephite Lands” 4 part series plus bonus episodes not available in full online anywhere. 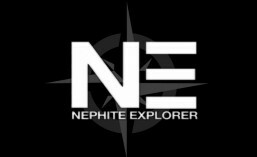 Help support the Nephite Explorer Project and spread the word! 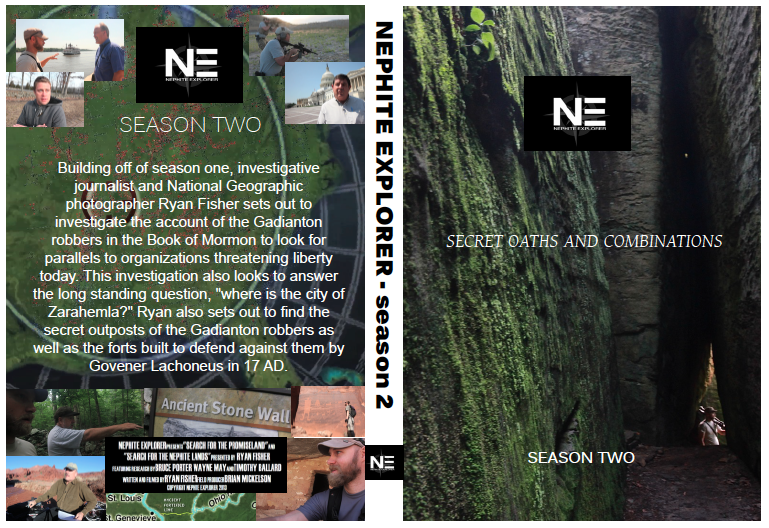 NOW ON DVD – SEASON TWO of Nephite Explorer. Join investigative journalist Ryan Fisher as he sets out to find the Gadianton Robbers of today by investigating the record of the Book of Mormon with prominent scholars and authors. Ryan also sets out to find the Gadianton robbers outposts where they took refuge for over 1000 years and the forts built by the Nephites to defend against the secret combinations here in North America. The locations are surprising as the latest finds from North American archeology reveals new insights into the plight of the Nephites and our plight today. Yes, they will be available on DVD soon. I have 3 episodes to finish of the 13 for season one. I’ll be making available DVD sets probably around the end of June. Thanks for the interest. thanks so much for an awesome show. looking forward to each week’s episode. i’ll be buying dvd season 1 soon and will get season 2 when it’s available. Please release via iTunes! I’ll buy them all!!! i would love to purchase all the TV episodes. Please make them available through the bookstore. You have been very detailed and informative. I purchased the above listed book. The ad says, signed copy. I was disappointed when my copy arrived with no signature. What can I do to rectify this? Just purchased Season 1. So excited to share this with my family. However, one of the DVD’s is blank. The DVD that is working has Part 1, 2, 3, & 4 on it. Not sure what is suppose to be on the other one. Could I please get a replacement 2nd DVD? I don’t want to miss a thing!!! I am assuming it has Part 5 on that one. i love this show! it is amazing. i can’t wait for season 2! i am also a mormon and obsessed with it. thanks for creating this wonderful show. My wife got me Season One for my birthday, and it just arrived today! Party in Oregon!! Thanks, Ryan! David, are you Cory Frogley’s brother? I know this investgative work costs a lot, but $25 per season seems a bit high. Any chance of a small discount if buying both seasons at the same time? It seems like it would be a great promotional tool. I could sell them for less but then there wouldn’t be a season 3. DVD sales doesn’t even come close to covering travel expenses let alone the thousands of hours researching and editing. Traveling all over the world isn’t cheap and I give it away on TV for free. The meager income from DVD sales is all I got next to advertisers on the show and what I can find in between the couch cushions:) Each DVD set has about 4 hours of programming. I should hope that all my efforts is worth $25 but if not, walmart has movies for $19.99 or less. Just sayin. I guess it comes down to what you want to support with your hard earned $$ and that’s a personal choice each of us has to make. K I figured out how to get to the purchase site. I selected both season 1 & season 2 but only one DVD season shows up in the checkout. How do I purchase both seasons at the same time? Will we be able to buy both seasons at the same time soon? Ryan any chance you can pit this in the iTunes Store? I buy Alex Boye’s CDs there and books and movies as well just a thought. It might give your work more exposure too. Love, love, love what you are doing! Yeah, I need to, it’s on my very long to do list. Thanks for the reminder, I don’t know which media distribution people want so thanks for the feedback. Love your show! I have learned so much and I look forward to each new episode! Keep it up! Great job! I have tried to email you multiple times and they keep coming back. I have questions concerning my order that I have not received or received any shipping notification. Please contact me at the email from this comment. Thank you. Hello, I have your order in. I am on the road filming until the 15th. As soon as I’m back I’ll mail it off. Sorry for the delay. I’m a one man band. Thanks for your patience. Ryan, I emailed you a couple days ago about an order I’d placed, but the email bounced–timed out after 48 hours. I want to order both of these dvd’s together. Your website won’t let me do that. Is there anyway I can have them shipped together instead of having two separate orders? Bumped into your program on YouTube last night! I LOVE it! My birthday’s coming up & I’m asking my wife for the DVDs! Great show! Walking with Wayne May on the mounds while he was explaining what he was seeing was way cool! Great job, Ryan! I ordered season one of nephite explorer on the 1 July. Any idea when it will ship? Love the show!!!!! I realize you are probably super busy. I purchased both seasons about three weeks ago and I’m super excited to watch them. Is there any kind of estimated time of arrival or a shipment date? I tried emailing you but that didn’t seem to work. Thanks for all you are doing! I will definitely be sharing this information with others, it’s something I think every Mormon should know. With the new TV station does this mean you will not make Season 3 available on DVD? Just an FYI – thrilled with True North TV. Ryan are you filming a 4 th season??? Thanks Ryan, appreciate your passion to bring the evidence to light! We will continue to support you by purchasing these Dvds even though i know it can’t cover all your overhead. DVD sales go a long way, you’d be suprised. A plane ticket here or there makes it happen. Thanks for the order. Hi, my husband wants this series really bad. Will you have more copies of season 1 soon? Ryan, thanks so much for all the research and evidence that you, Wayne, Rod, Bruce and Tim have shared. I have previously purchased seasons one and two and am now ordering seasons three and four. I also have subscribed to TrueNorthTV. The information that you guys share are so clear and easy to understand. I share your websites and information with as many people that will listen. In the episode that talks about the soil samples in and around Hill Cumorah, I remember seeing the details of that on the TV episode, but on line on TrueNorthTV I didn’t see it in the presentation, only that it had been discussed previously. What episode is that in? Again thanks for all you do. I look forward to more in the future. Hi Ryan! It’s always amazing to me how the Lord directs you to where your suppose to be when the time is right. Just yesterday I was on YouTube and came upon your videos. I have only watched a few videos so far but have read everything that is listed on this website. I FEEL LIKE I JUST WON THE LOTTERY! I have been searching and reading books on this stuff for a few years now and always wondered if someone in the church would do exactly what your doing! Since I’m still a “newbie” on all this, I am so excited to buy your DVD’s and start learning more. Thank you, thank you, thank you, for doing what your doing. I know you spend countless hours, money, and lots of sacrifice to bring these shows to people like me and I really appreciate all of your hard work. God Bless! Hi Ryan- Yes, I joined! Thank u so much! Is it possible to purchase DVDs of all the nephrite explorer tv episodes from. Seasons 1 thru 4? If so how co I go about obtaining them ? Hi- When are you going to have Season 1&2 DVDs back in stock?? Please tell me I haven’t missed out on muy chance to own them!!! I would like dvds of all years after season 1 and 2.Is this possible? Do you have any books? I see you got dvd’s.